David G7IBO received his award in Val d’Isere where he is skiing! 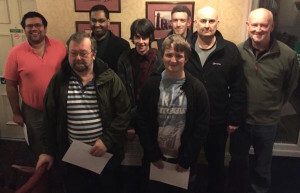 It’s Christmas Contest Results time at Wythall Radio Club. Contest supremo Lee G0MTN was in the hot seat last night to give us a presentation on the facts and figures of the 2015 event and reveal the changing trends in the contest across the years. Pretty much half the club’s total membership of over 80 took part in the event at some point and once again the contest succeeded in its main aim, to ensure that members “Have Fun with RF” (as the club’s motto goes) over the festive season. 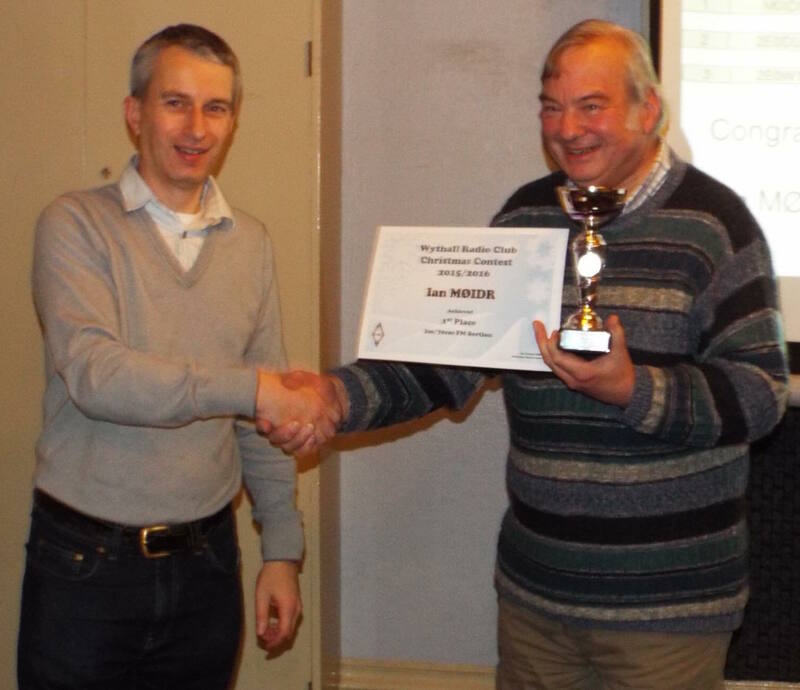 And to the results then – two brand new winners this year: Club Treasurer, Ian M0IDR was the victor in the 2m/70cms FM section, quite an achievement all the way from Evesham(!) – just pipping Chair Anita 2E0DUO into second place. The overall winner in the open section though (and winner of the G7OJO Trophy) was David G7IBO. He won by a whisker from first time entrant (and new Advanced licensee) Dave M0IFT, who ran him extremely close for a first time entry – one to watch for next year maybe? Congratulations to all winners and runners-up and we hope to see you all again for our Easter event at the end of March, when some serious prizes of Chocolate Easter Eggs will be up for grabs! Wythall Radio Club is pleased to announce that our next two Foundation Courses will be commencing this February. We are running a classroom-based course starting on Monday 8th February at 8pm in our shack in the basement at Wythall House, Silver St, Wythall, B47 6LZ. Alongside this, we are also running an “on-line” version of the course – this is for those who are not local to Wythall or cannot be available on Monday evenings. This course starts on the 15th February, but please note that you need to register for this by 1st February, which its not that far away! More information is available on our training page here. This Tuesday evening is an exciting one in the Wythall Radio Club Calendar. We have a visit from the General Manager of our National Society the Radio Society of Great Britain. Graham Coomber G0NBI has been in post for about 4 years now and this week’s visit is all the more poignant for being his last to us in the role – this is because he recently announced his imminent retirement. It will be great to see Graham again, not least because he is not only an official representative of our National Society but also because, along with his wife Von, he is very much a friend of our club. 20:30 in the Darts Room at Wythall House, if you want to come along – set your GPS for Silver Street, Wythall B47 6LZ and it should bring you to us nicely! 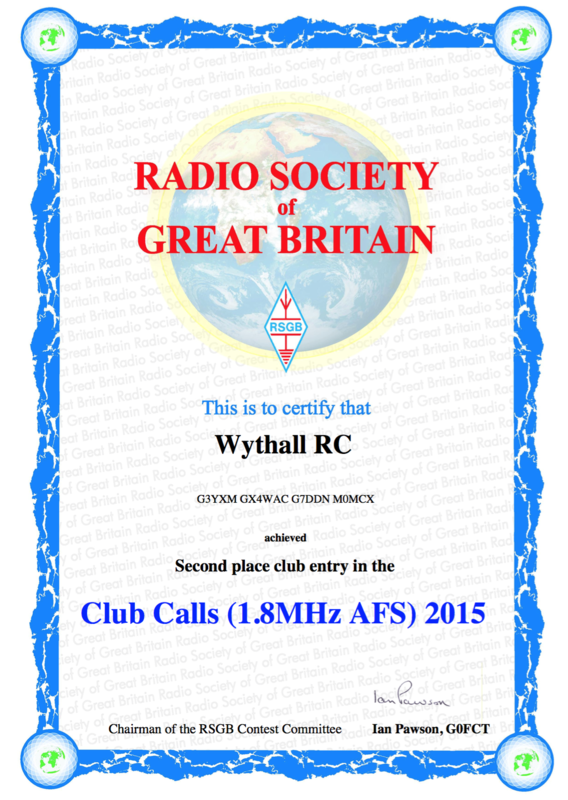 Wythall Radio Club members are celebrating today following the release of the latest set of contest results. 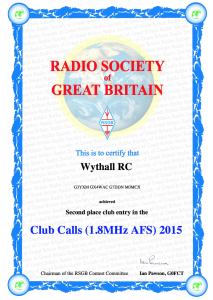 Club members recently took part in the RSGB’s Club Calls Contest (November last year) and the results show that Wythall RC has finished in 2nd place, after a few years finishing 3rd. Our congratulations go to the winners, Bristol Contest Group, who are a very hard act to beat, but with our team of “ordinary” club members pulling together, we managed what we consider to be an excellent result. However, the results also show that we are the top non-contest club in the country in this event, something of which we are very proud. Pictured is our hard-earned certificate. 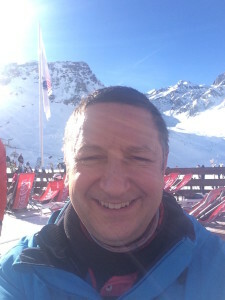 Our thanks go especially to our Club Calls Contest co-ordinator Dave G3YXM who whips us into shape each year for our regular assault on the event. Perhaps next year, we can steal the top spot! 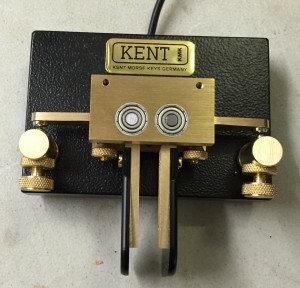 We hope it will be, for the key in question is Wythall Radio Club’s brand new Morse Paddle Key. For some time now, our More Code training class, ably led by the “Two Johns” M6KET & G4OJL, have been short of their own twin paddle key. No longer! 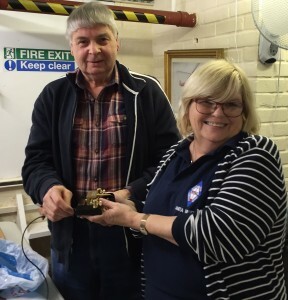 Last night at the club, Chairwoman Anita 2E0DUO presented the class with a brand new Kent key, with help from our friends at Martin Lynch & Sons. 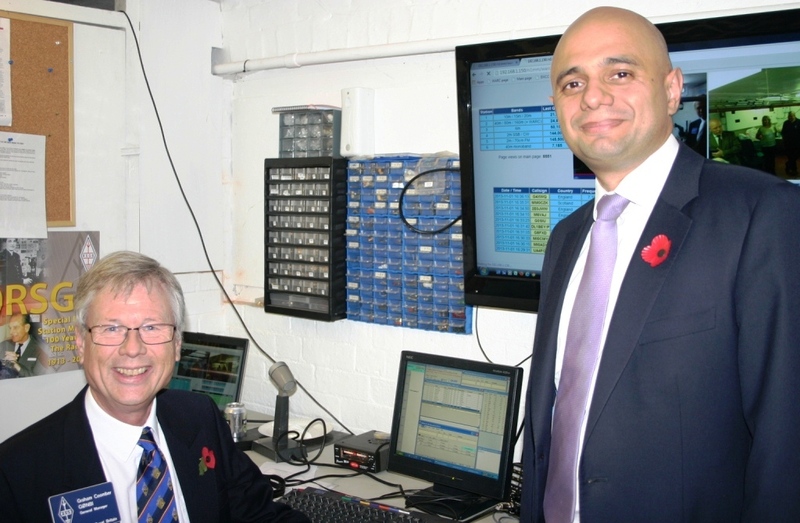 Wythall Radio Club’s Morse Class has been running now for around 5 years and remains very popular with members. If you are interested in taking part, why not contact John M6KET by contacting him at john (at) johndaws (dot) plus (dot) com? Meantime, click on the photos for a better look at our new baby! 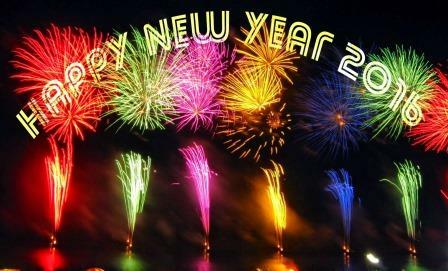 Happy New Year from Wythall Radio Club! The members of Wythall Radio Club wish all radio amateurs worldwide the very best of New Year wishes. May all your New Year desires come true in 2016! Remember to subscribe to our site via email (left) to make sure you keep up to date with all the news from our busy club! For our part we will be having fun with RF throughout 2016 with a full programme of events planned, including our annual Hamfest on March 20th, to keep members and non-members happy. See our calendar page for more details!